I N D I V I D U A L I T Y: ME! X JOEY MA is out! #12 superwoman! I still can't believe I get to style DoDo Cheng. In fact, I've never styled any celebrities before. And I can't believe the first celebrity that I style is DoDo, I feel like the luckiest person in the world. She is a legendary movie actress, tv actress, tv host and radio host. And she is famous for being super talented and super smart. Moreover, she hasn't done any fashion shoot for any magazines for more than 15 years, therefore, when I asked DoDo to be my model, and she said yes..... I still feel like this is not real. I don't know what she sees in me.... and I don't know why she says yes.... I just feel very very very special. I hope you guys will enjoy the videos and photos. This is the photo for my column. It is based on her character from my favorite movie of her, "神奇兩女俠 Wonder Women". I see this movie as a cult classic. It came out in 1987. And as I get older, everytime I watch this movie, I understand it better and better. I recommend everyone who loves movie and fashion to please watch this amazing movie. The styling in it is just priceless. And I love the 80's, so I use all these neon and bright colors, such a fun photo! Now, here is the part that I never even dreamed of it before.... DoDo and I are on the cover on ME! Magazine. At first, I only asked DoDo to be my model for my column, and then when chief editor finds out, she asks me if I could ask DoDo to be on the cover. I have to be honest, I didn't want to ask at the beginning. First of all, I don't want to trouble DoDo. We originally agreed in 1 outfit, and now I have to style her in 5 outfits, that means it will take a lot more time.... DoDo is doing me a huge favor for helping me already, and now ME! wants to add extra work on DoDo. I seriously feel uncomfortable. But I have to ask her because I am working for ME!, and guess what, DoDo says yes.... She is just so nice and sweet to me, I am very very grateful about all of this. This outfit is based on her 1991 comedy classic, "賭霸 Queen of Gamble". I want to style us in powerful outfits. I always love Moschino, and sometimes I feel sad because it seems Moschino is not so popular anymore compare to the 80's. Therefore, I have to take this opportunity to style DoDo in Moschino piece. I am so happy with the result, I hope you guys will like it. This is a... lifetime... experience for me. 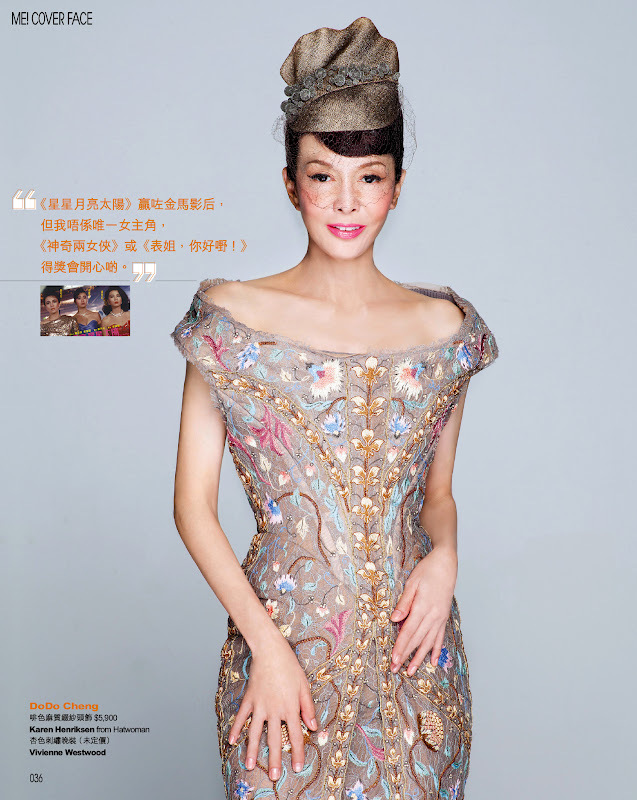 My favorite actress DoDo is wearing my favorite designer Vivienne Westwood showpiece dress! I am in heaven! Thanks so much to the Hong Kong PR team who works for Vivienne Westwood. I can't believe they really ship this amazing dress to Hong Kong for this photo shoot. This is insane!!!!!!! Thank you so much! All the detailing on this dress is why I love Vivienne Westwood so much. And of course to my favorite hat shop in Hong Kong, Hatwoman, for lending me all these amazing headpieces! The outfit is inspired by her 1988's classic, "月亮星星太陽 Moon, Star and Sun", which she won best actress on the 25th Golden Horse Awards. She plays an outrageous prostitute in this movie. And I want to make a total opposite flow from the character. A prostitute can also be very elegant after all these years. This outfit is inspired by her 1988 movie, "女子監獄", which means a female prison. I specially want to style DoDo in a jumpsuit. Therefore when I see this Fendi jumpsuit, I tell myself I have to use this piece. Plus the Stephen Jones headpiece, Fleet Ilya belt, and Jimmy Choo shoes combine all together, all I can say is a prisoner can be glamorous too. Last outfit is inspired by her 1990 comedy and award winning classic, "表姐，你好嘢! Her Fatal Ways" which she is the first actress that won best actress award in Hong Kong Film Awards based on a COMEDY! I am so proud of her! The signature of the character is wearing glasses. Therefore, I just take this element and style DoDo in a very cutie look hahaha. And once again, DoDo pulls off this look nicely! Well done! This video just shows how cute and down to earth DoDo is!!!!!!! To all those arrogant celebrities, young and old ones, please take a look and learn from DoDo!!!!!!! I really can't stand self center and rude people! Big love to you all! And my gosh haha, I look sooooo happy in the video, I just can't help but non stop smiling hahahaha, I heart DoDo so so much! She takes care of me so well during the whole photo shoot and video shoot, I am so grateful!!!!! ME! Do Do Cheng X Joey Ma! from Joey Ma on Vimeo. Yesterday I said I would make a video speaking in English. This explains how grateful I am and how much love I have for DoDo Cheng. She is so straightforward, down to earth, and real! I really admire her personality. And of course I've been enjoying her works for so many years already. I really hope she will keep doing the radio show. This is the longest post I have written so far, I really hope you guys will read it though and enjoy it. i love all of the outfits you styled for dodo !